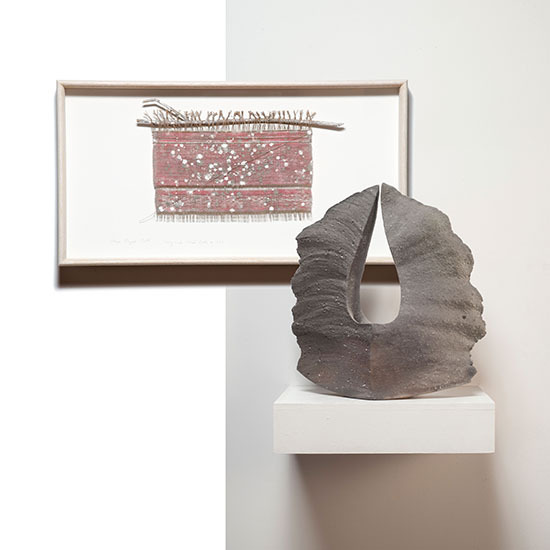 From September 16th to November 4, 2016, the Bendheim Gallery of the Greenwich Arts Council in Greenwich, Connecticut will present Contemporary Art Influenced by Korea and Japan: An Unexpected Approach, curated by browngrotta arts. The exhibition includes select works of ceramics, textiles, baskets and sculptures by artists from Japan, Korea and the United States that each reflect an Asian sensibility. The 23 artists in this exhibit have a close relationship to a traditional craft aesthetic, manifested in a contemporary manner. They have chosen conventionally Asian materials and/or techniques (dyes, papers, gold leaf, persimmon tannin, kategami) used in both time-honored and unconventional ways. Examples include studies by Hiroyuki Shindo of the vanishing art of natural indigo dyeing and by Jun Tomita on ikat dyeing. Jennifer Linssen’s innovative sculptures of katagami and Keiji Nio’s Interlacing-R, which references complex Japanese sumihimo braiding reimagine conventional techniques. 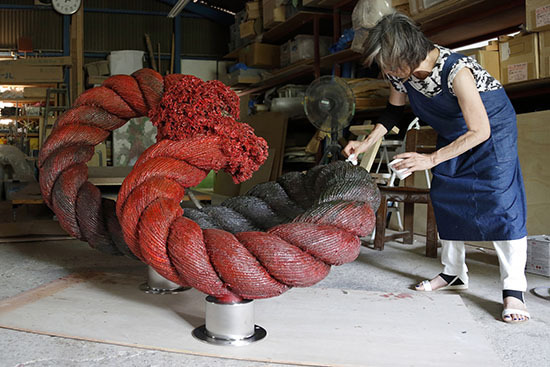 Masakazu and Naomi Kobayashi, Naoko Serino and Kyoko Kumai also create new relationships among disparate material and techniques. 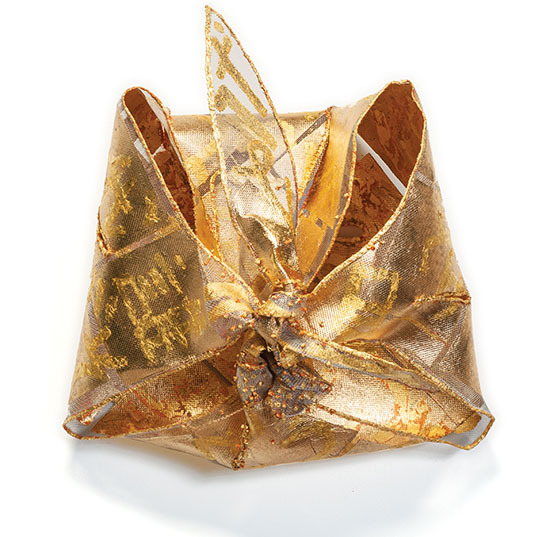 In other works, like Kiyomi Iwata’s Auric Gold Fold, Glen Kaufman’s Shimogamo Scrolls: Studio View II and Jin-Sook So, Pojagi Constructions I and II, gold and silver leaf play a role, their luster and longevity suggesting immortality, power, divinity. The artists share a concern for surface and material interaction, evident in Chiyoko Tanaka’s Grinded Fabric-Three Squares Blue Threads and Blue #689, of linen distressed with earth and stones, Hideho Tanaka’s Vanishing and Emerging series of stainless steel and singed paper and Mariyo Yagi’s twisted rope sculpture, A cycle-Infinity. The artists in Contemporary Art Influenced by Korea and Japan: An Unexpected Approach create work that is formal and contained while visibly involving the hand of the artist. This exhibition is a collaboration between the Greenwich Arts Council and browngrotta Arts. Nancy Moore Bess (United States); Pat Campbell (United States); Kiyomi Iwata (Japan); Glen Kaufman (United States); Masakazu Kobayashi (Japan); Naomi Kobayashi (Japan); Yasuhisa Kohyama (Japan); Kyoko Kumai (Japan); Jennifer Falck Linssen (United States); Keiji Nio (Japan); Toshio Sekiji (Japan); Hisako Sekijima (Japan); Naoko Serino (Japan); Hiroyuki Shindo (Japan); Jin-Sook So (Korea/Sweden); Norkiko Takamiya (Japan); Chiyoko Tanaka (Japan); Hideho Tanaka (Japan); Takaaki Tanaka (Japan); Jun Tomita (Japan); Mariyo Yagi (Japan); Chang Yeonsoon (Korea); Jiro Yonezawa (Japan); Shin Young-ok (Korea). The Bendheim Gallery is located at 299 Greenwich Avenue, Greenwich, Connecticut; 203.862.6750; info@greenwicharts.org.